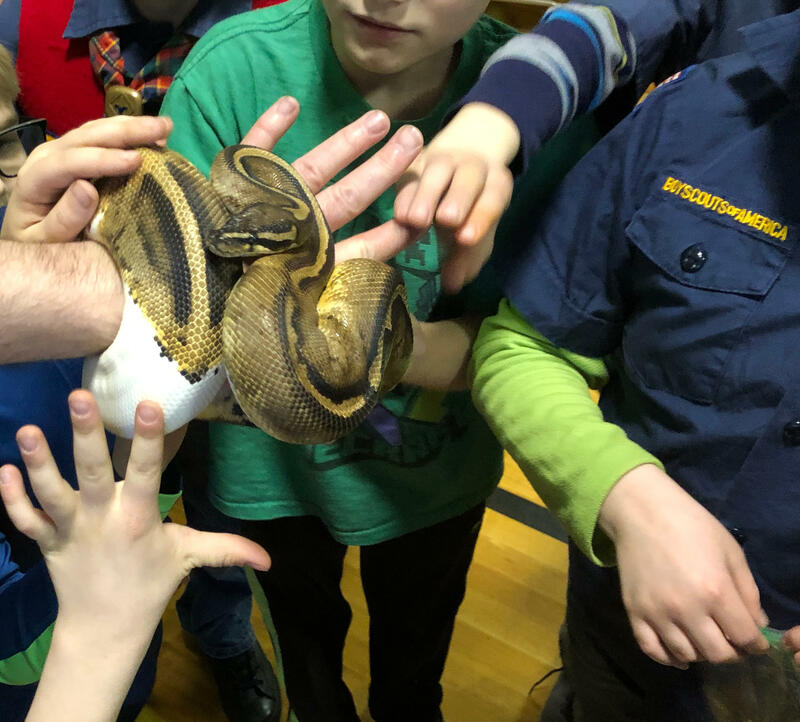 What a wild night with the Chicago Herpetological Society at our March Pack meeting! I hope everyone had fun squirming with the snakes, lizards, and frogs. The President of the CHS, Rich Crowley, had so much great information to share about these amazing creatures. I expect you learned something new, and many held a snake entirely on your own! Mr. Crowley also bestowed on Pack 99 the honor of officially naming one of their new snakes. 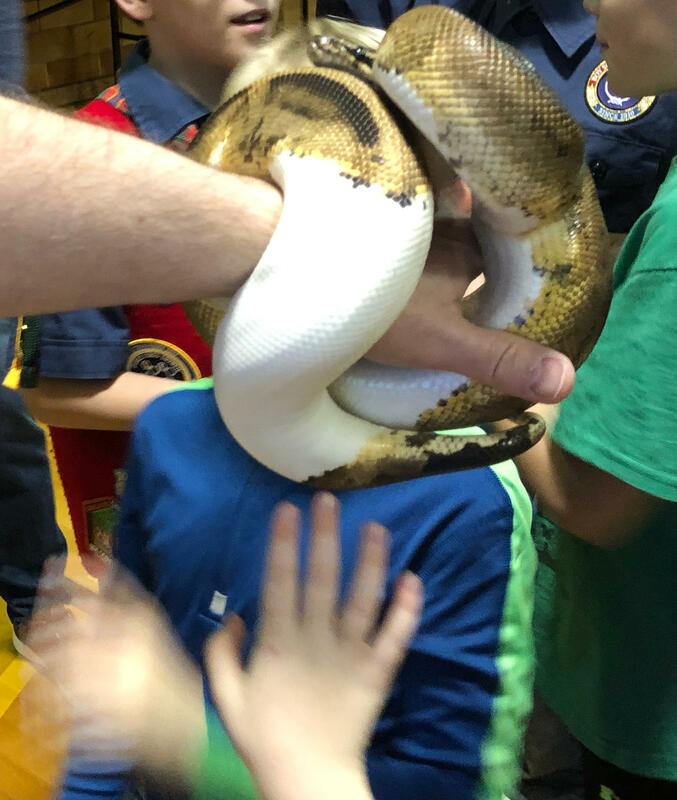 Our selection will be announced at the upcoming ReptileFest — the Nation’s largest educational reptile show — on April 13-14 at Northeastern Illinois University! Our job is to brainstorm as a Pack names for the snake, pictured below, that we all had the chance to meet & greet at our Pack meeting. Remember? It was half albino and half with multi-color patterns. So cool! 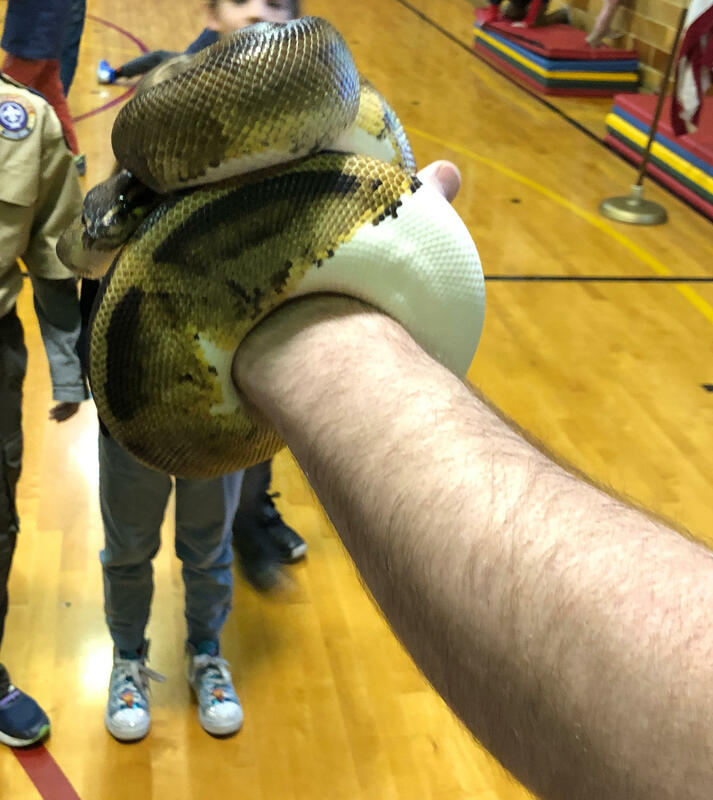 Please include your scout’s suggested name for the snake in the comments below, post on our Facebook group, or email the Cubmaster as soon as possible. Once we have a good collection of names in, I will post an online ballot for everyone to cast a vote for their favorite name. 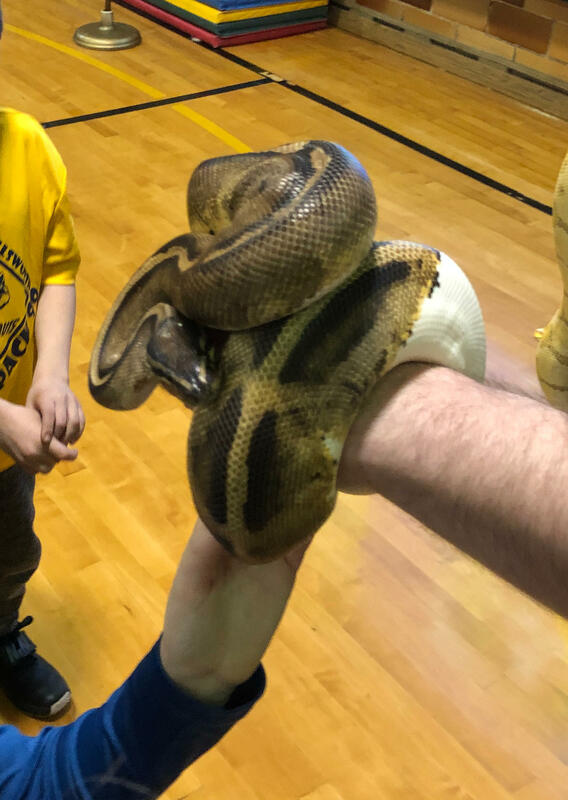 If you are interested in attending ReptileFest on April 13 or 14, please let me know ASAP so we can coordinate a group. Mr. Crowley is offering our Pack a special group rate discount for the tickets that are normally priced at $8 for ages up to 11 and $12 for 11+. So, get those thinking caps on and let’s hear some awesome ideas for names for this unique snake! Thank you so much for your family’s interest in joining Cub Scouts with your kindergarten boy or girl! Pack 99 at Ellsworth Elementary looks forward to meeting you and sharing years of adventure together. The Lion program is specifically designed to introduce Kindergarten-aged girls and boys to a lifetime adventure in Scouting. The mission of the BSA is to help young people build character, learn citizenship, develop personal fitness, become effective leaders, and have fun in the outdoors. The Lion rank encourages boys and girls to learn and explore through hands-on, high-energy activities while spending focused time together as a family. As the parent or trusted adult of a Lion, you will collaborate with the other adults to share leadership of the group backed by direct support and guidance from the Pack. Your team efforts will help create memories that will last a lifetime and build stronger families as your Lions discover the fun of Scouting. To find out more about joining Pack 99 and the Lion program for Kindergartners, check out our Parent Orientation Guide online. This includes a great video over-viewing everything Cub Scouts has to offer as well as the many adventures Pack 99 experiences each year. For a bit more detail into our program, open the Pack Handbook. You may also email the Cubmaster directly anytime to answer your questions. We’ll host a new scout registration event soon after school starts in September 2019 (typically, at the Ice Cream Social event), and we’ll have a flyer to advertise so you know the date. We’ll also post more information on this website, so bookmark it now! We look forward to seeing you in our 2019-2020 Scouting year. The 2018/2019 Scouting year brings a historic evolution of scouting in the United States. Now, both girls and boys may join Cub Scout Pack 99 for all ranks, Kindergarten through 5th grade. The BSA conducted extensive research through surveys and consultation with education experts and determined that because families today are busier than ever, they are looking for more convenience from youth programs. Since the experiences featured by the BSA are appealing to today’s busy families, it makes sense to extend the same offerings to girls and boys. The priority of the BSA is to bring the benefits of Scouting to more youth while remaining true to their mission of preparing young people to make ethical and moral choices over their lifetimes by instilling in them the values of the Scout Oath and Scout Law. By welcoming both girls and boys into the program, even more youth will have access to the character development and values-based leadership that Scouting promises. The unique approach offered will build on the proven benefits of the single-gender program while providing character and leadership opportunities for both boys and girls as well as meeting the needs of today’s busy families. For Cub Scout Packs, the Scouts will formally organize into separate all-girl and all-boy dens for each rank, and all dens will continue to meet together as a single Pack. We are excited to open up this opportunity for all girls and boys of Ellsworth Elementary School this year and look forward to sharing many new adventures in Scouting with more families! If you are interested in learning more and having your daughter or son join Pack 99 this year, please check out our Pack Handbook and meet us during the Ellsworth Ice Cream Social on September 13, 2018. The Pack will be available to answer your questions, share our experiences, and help you sign up to get your entire family’s scouting adventure started! A detailed FAQ from the BSA to answer all your questions. An overview video introducing the expansion. A Family Scouting Q&A video. The BSA’s Family Scouting website. If you have additional questions, please contact the Cubmaster. If you are interested in joining or need a refresher, learn more about our Pack, and if you are a current adult partner, please join our Facebook group! You may also submit your new Scout and Adult Volunteer applications online. This website helps our Pack “do our best” with clear communication as well as provide a public portal to feature our Pack to prospective members and our community we serve. We also link through to our rank tracking and official calendar app, Scoutbook, which allows Pack families to communicate with their Dens and preview upcoming events in our Pack calendar. This site works well on your mobile device, tablet or desktop. Simply add the site (http://www.cubscouts99.org) to your phone or tablet home screen or bookmark it in your desktop web browser. You’ll then have quick access to Cub Scout reminders and how-to guides. Instructions are available for iOS and Android devices. As a new feature to our Pack communications in 2017-2018, we now have a closed Facebook group available to all adult partners affiliated with Pack 99. We will include announcements, discussions, and a full calendar (which you may feed directly to your mobile device’s calendar app) in the group to help keep us all connected and up-to-speed with Pack 99 activities. Join the Cub Scout Pack 99 Adult Partners group! This year Pack #99 will have “informal” scout shirts available for each scout at no additional cost. Adult partners may also purchase their own shirt for only $10. The shirts will be the same fabric as the popular “Running Club” shirts offered by the school (Youth Sport Tex), and the graphic design is included below. For the scout’s shirt, the color will be bright “golden yellow” with a navy blue logo. For the adults, we’ll do the reverse coloring of navy blue shirt with the golden yellow logo. This is a great example of what your Popcorn sales can do for our Pack, so get ready for another great year of popcorn fun!